Easter Week 2019 on the Costa del Sol, Chaparral Golf Club. Easter week (Semana Santa) in Andalusia is an event that transforms towns and cities across the region. 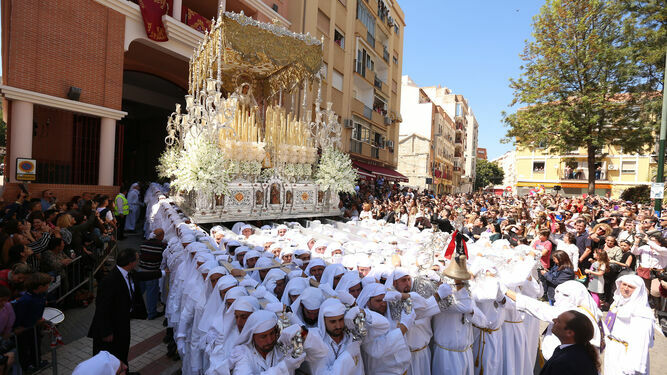 Processions of elaborately decorated floats with Jesus and Mary statues, groups of pointy-hood wearing Nazarenos (penitents), and shrill brass bands, walk slowly through the streets, from their parish church to the cathedral and back. It´s an amazing experience, and a great time to come to Costa del Sol if you want to imbibe some deeply-held traditions that have less to do with religion than with social groupings and rituals. The traffic is closed most of the week in the city centres and the solemn processions take over in the afternoons (so be sure to play your golf in the morning). The aroma of burning candles, the passionate strains of a late night saeta (traditional song) and the mournful trumpets that accompany images of Christ and the Virgin Mary, create an ambience that can transport even the most casual observer to another time and place. Easter, like any other festival, has its own special flavours and on the Costa del Sol the dishes will vary depending on where you are but you can expect local dishes to feature fish, vegetables and special sweets and cakes. A favourite dessert during Holy Week in Andalucia is rice pudding (arroz con leche) and you can expect most local bakeries to be offering Torrijas. These are slices of bread dipped in egg then soaked in wine or milk, fried and sweetened with sugar and sprinkled with cinnamon. Another typical sweet at this time of year is the Pestiño (fried, honey-glazed pastries). In the province of Malaga, the Easter week celebrations in Alhaurín el Grande, Alhaurín de la Torre, Antequera, Archidona, Arriate, Campillos, Istán, Riogordo, Ronda and Vélez-Málaga are especially relevant and represent the true value and beauty of these traditions. Other things to do apart from the processions? There is plenty to do in Málaga and Fuengirola! Malaga has plenty of art museums, monuments, shopping of the most famous brands, street art, beaches… and of course, a fantastic variety of golf. Chaparral Golf Club is a haven of nature and tranquillity in the heart of Costa del Sol.